In this project I made a touch controlled light that works based on Arduino Capacitive Sensing Library. In this project I made a touch controlled light that works based on Arduino Capacitive Sensing Library. You can make a touch sensor by using a aluminium foil(any metallic object will work). you can turn on or turn off light by touching on a aluminium foil. The capacitiveSensor library turns two or more Arduino pins into a capacitive sensor, which can sense the electrical capacitance of the human body. All the sensor setup requires is a medium to high value resistor and a piece of wire and a small (to large) piece of aluminum foil on the end. At its most sensitive, the sensor will start to sense a hand or body inches away from the sensor. 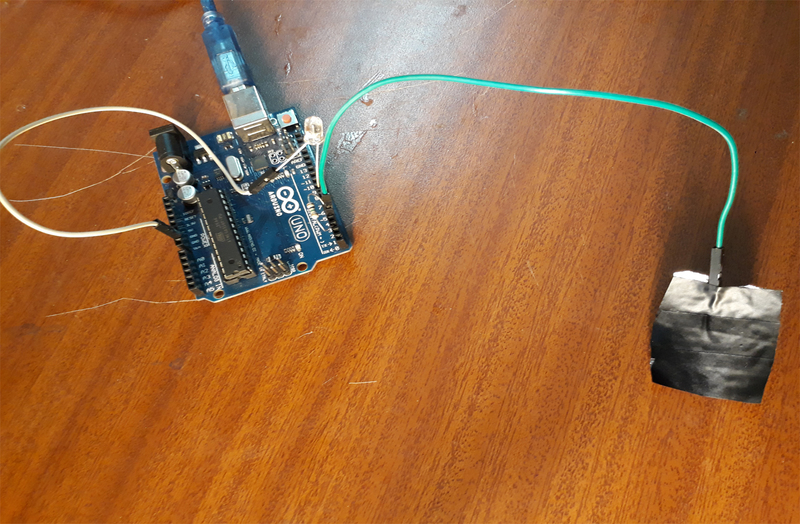 he capacitiveSensor method toggles a microcontroller send pin to a new state and then waits for the receive pin to change to the same state as the send pin. So with high resistor this act likes proximity sensor. The touch sensor can be made from any metallic objects.I have used aluminium foil to make this. For many applications, a more useful range of values is obtained if the sensor is covered with paper, plastic, or another insulating material, so that users do not actually touch the metal foil.